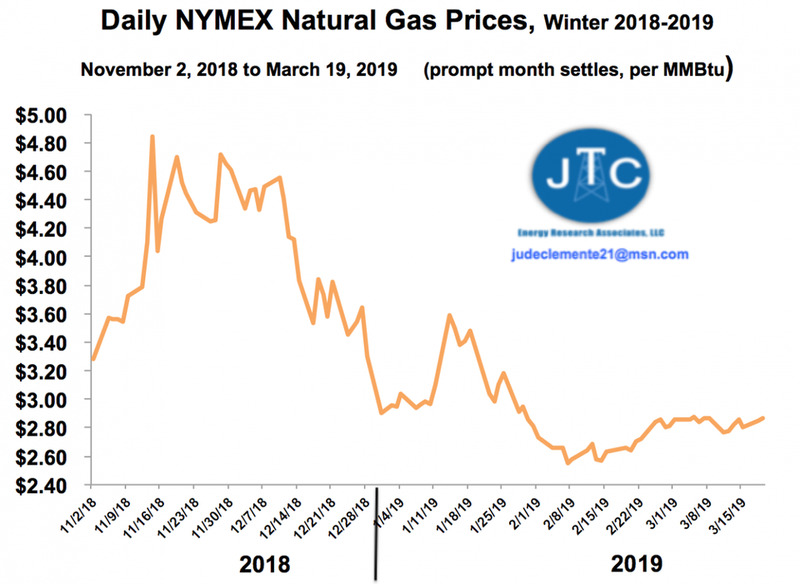 Where are natural gas prices headed this Spring? It is the first day of Spring, let us talk natural gas! 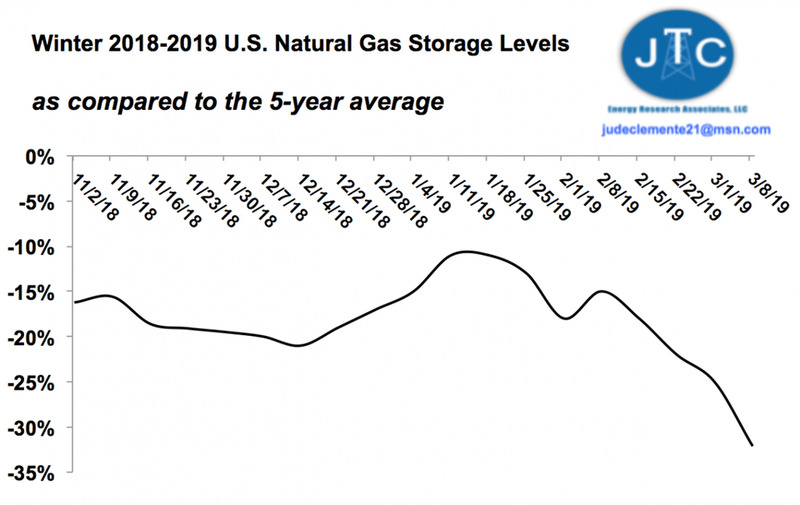 Back in November, a cold and early start to winter 2018-2019, augmented by a massive storage deficit, rallied prompt month natural gas prices to around $4.90 per MMBtu, the highest prices we have seen since 2014. A warm December pulled prices back down again to the low-$2.90s right after Christmas, and we rose to $3.60 in January before dropping back down to $2.80 to close the month. Indeed, right until February hit, it had been the most volatile U.S. gas market in a decade. But gas has been range bound over the past six weeks, with February prices fluctuating just 31 cents, from $2.55 to $2.86. This is just 40% of the variation that we saw in January. Interestingly enough, it was a rather cold February, especially compared to the previous two Februaries that were historically warm. And it is worth noting that the very strong mid-$2.50s support level was tested in February again and held, just like it did in the previous two Februaries. 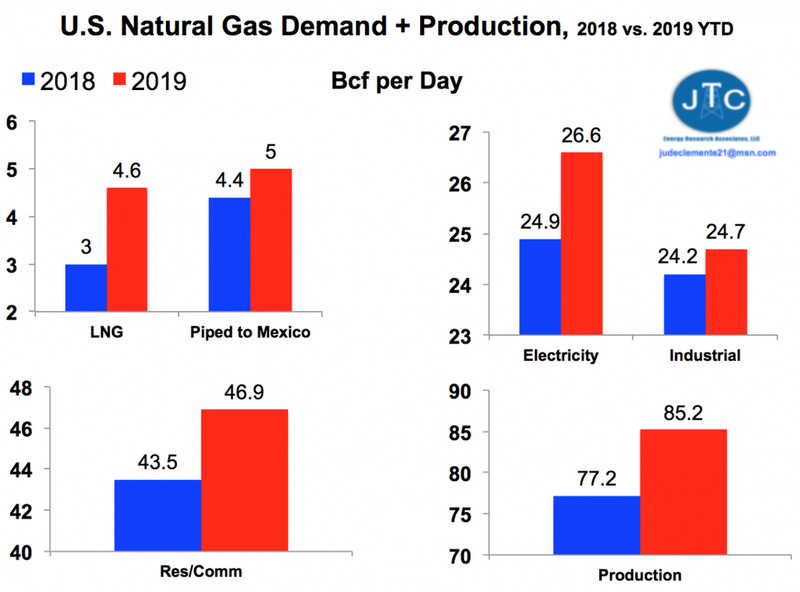 March, meanwhile, surely “came in like a lion.” For example, gas heating demand over the first two weeks of this month averaged 45 Bcf/d, or 20-25% higher than year-ago levels. Prices closed at $2.87 yesterday, the highest prices in two weeks. Gas prices are now about 8% higher than where they were this time last year. Closest technical resistance stands at $2.90 and $2.93, with support at $2.82 and $2.76. Increasingly so, U.S. gas prices will be the product of record production colliding with record demand, the latter you should know encompasses growing exports. And for those of you doubting production, EIA forecasts a non-stop 15% rise to over 100 Bcf/d by 2025 and much more far beyond that. Case in point, there are some 27 new pipelines in the works in Appalachia, which holds the Marcellus and Utica shale plays that yield 37% of all U.S. gas supply. Widespread optimism for high production is why those outer contracts on the NYMEX forwards curve are in backwardation. Faith in supply explains why prices actually dropped during Polar Vortex 2019 at the end of January. As for U.S. storage, although the market has largely shrugged it off, the deficit has been getting much worse. We had a 204 Bcf withdrawal reported last week, which was more than double the 99 Bcf withdrawal for the five-year average for the week. It was the largest March gas pull in five years. So at 1,186 Bcf, we are now a whopping 32% below the five-year average for inventory, compared to 11% below back in January. We currently have a 569 Bcf deficit. March though is indeed heading “out like a lamb,” per NOAA weekand two week maps. There is no blue out there, with Chicago hitting the 50s and New York City in the 60s. At 47 Bcf and 30 Bcf respectively, the next two storage withdrawals are projected as smaller than average. Our first injection is currently slated for the week after. At ~1,100 Bcf, we will be coming into the injection season with historically low gas storage, but not as low as 2014 when the Polar Vortex helped plunge us to 824 Bcf at the end of March. Last year, we closed withdrawal season at 1,281 Bcf Tcf for gas in storage, for the week ending April 20. It has been a remarkably balanced winter. Of the 20 weeks of wintersince November, 10 have been classified as warmer and 10 colder than normal. Do not sleep on this April. Remember April 2018 when three of the first four weeks in the month were withdrawals, something that nobody was predicting at the end of March. Do not sleep on this May. Remember May 2017 when a pipeline construction delay (3.25 Bcf/d Rover out of Appalchia into the Midwest and Canada) pushed prices to their highest level in 14 weeks. Looking past that, we continue to break records for summer gas demand. Power burn for summer, for instance, jumped nearly 40% from 2014 to 2018, as our electricity generation switches more and more to gas. And with exports ramping up (three more LNG facilities should be producing by July), gas prices could rise well above $3.00 this summer, a threshold they only surpassed once last summer (June 15). The United States Natural Gas Fund L.P. (UNG) was trading at $24.93 per share on Wednesday afternoon, down $0.23 (-0.91%). Year-to-date, UNG has gained 6.90%, versus a 5.68% rise in the benchmark S&P 500 index during the same period.